Many people view computer programming as a narrow, technical activity appropriate for only a small segment of the population. But, an interdisciplinary team of researchers from MIT’s Media Lab, the University of California’s Digital Media and Learning (DML) Research Hub, and Harvard’s Berkman Center for Internet & Society is seeking to change that. With a recently awarded $1.5 million grant from the National Science Foundation (NSF), the researchers aim to engage a broader range of young people in computer programming by building on their interests in areas such as music, dance and sports. The new initiative extends the Lifelong Kindergarten group’s Scratch programming language, which enables young people to code their own interactive stories, games and animations. To ease the transition into coding, the MIT team is developing a series of interest-based “microworlds” — specialized coding environments designed to connect with young people’s interests. For example, those interested in dancing could use a microworld to program musical beats and the movement of dancing characters on the screen. “The most powerful and effective learning happens when young people pursue personal interests and passions,” said Mimi Ito, research director of the DML Hub, which is based at UC Irvine. As part of the three-year NSF grant project, Ito and her team will conduct ethnographic research studies examining what types of technical and social support enable youth from diverse backgrounds to become engaged in learning to code. The initiative will offer a variety of online activities and events that will help youth see coding as relevant to their interests and useful in a wide range of fields, from animation to zoology. In addition, the team at Harvard’s Berkman Center will investigate policies and practices designed to protect young people’s privacy and safety online, while opening new opportunities for learning. 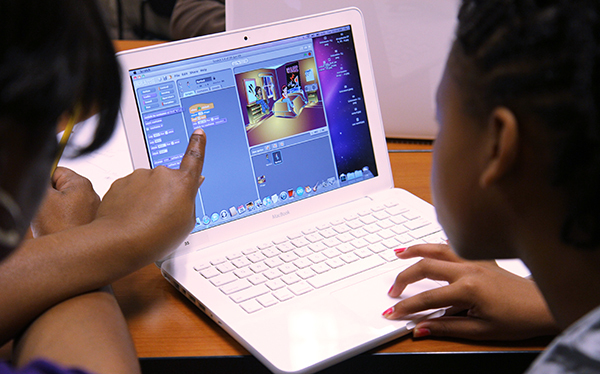 This summer, the research team is piloting initial activities in libraries in Los Angeles and other cities nationwide, offering online mentoring to help youth design their own interactive games using Scratch. The project responds to NSF’s cyberlearning challenge to “draw in and promote learning among those in populations not served well by current educational practices,” and addresses national priorities in workforce development, equity and the need for a technologically-fluent public.